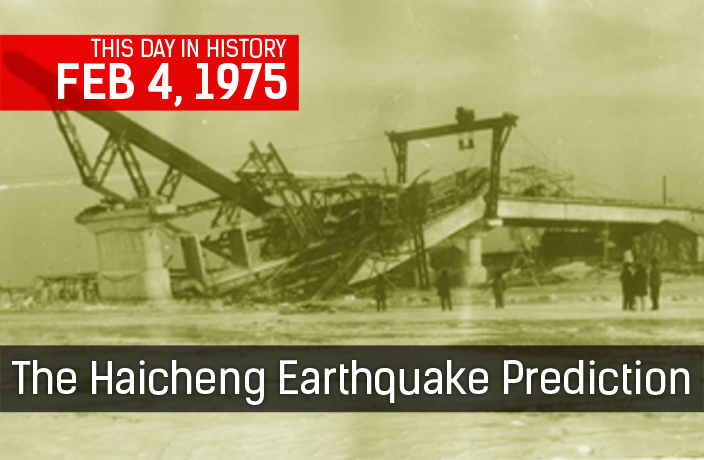 On February 4, 1975, an earthquake measuring 7.3 on the Richter Scale rocked Haicheng, Liaoning province. Thankfully the death count was low, Chinese authorities having ordered an enforced evacuation of homes in what is widely cited as the first earthquake successfully predicted. Occuring as it did during the Cultural Revolution, record keeping was disordered. And the failure of officials to predict the devastating 7.8 magnitude Tangshan Earthquake a year later, which killed some 240,000 people, led many to question the the prediction claim (belief in earthquake prediction became an element of ideological orthodoxy that distinguished true party liners from right wing deviationists). The light loss of life - which they set higher than 300 at 2,041 - was attributed to a number of fortuitous circumstances, including earthquake education in previous months, the fact it occurred at 7.36pm, when people were neither working nor asleep, and the durable style of housing construction in the area. On arrival the Swedish consulate reiterated that he had officially been awarded the Nobel Prize for Physics. To this day, 152 years after his birth, Sun is one of the most revered political figures among Chinese people.